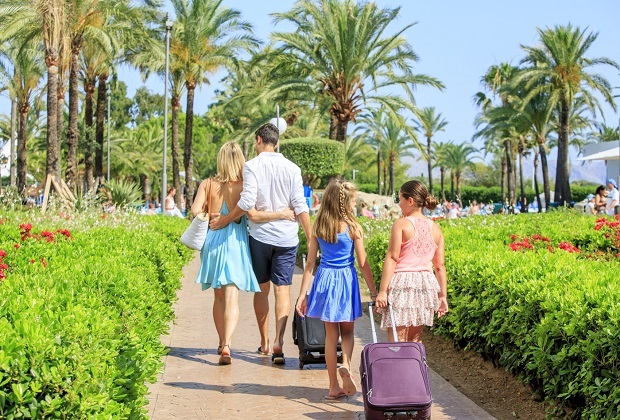 We know that for many people, family holidays are the highlight of the year. And we also know that you don’t necessarily want to spend lots of money when you arrive. With our all-inclusive holidays at Club MAC Alcudia, all of your food and drink and accommodation is already paid for. As long as you keep your wristband on, then you will only have to pay for optional extras. To help you plan your holiday at Club MAC, we’ve put together a top ten of free things to do near our resort. Whether you’re looking to entertain the kids, or want to find a grown-up day out, there’s plenty to choose from. We are just under 1km away from the stunning Playa d’Alcudia. With miles of golden sand, shallow waters to splash about it and plenty of activities to try, it’s a must-visit. If you don’t fancy the walk, we run free shuttle buses to the beach and back all day long. And if you want to try out any sporting activities, there’s everything from kite surfing to ski tube riding. For a cost-effective, lovely day out, stick to swimming and sunbathing. The peaceful and beautiful Old Town is a great place to wander. Go at sunset to appreciate some stunning views or spend the morning exploring. Old Town is situated within ancient Moorish walls, where you can see the truly impressive Xara and Saint Sebastia gates. For a small charge, you can hire a bike and explore the area on two wheels. Head to the modern town centre and then to the last remains of 2nd century Roman occupation in Pollentia. If you want to keep costs down, it’s also walkable, just outside the Old Town. Get up early and head into town for the Sunday market. It starts at 8am and you’ll find treasures including handcrafted jewellery, clothing, souvenirs and food stalls. Even if you don’t want to buy anything, it’s lovely to explore. All Club MAC guests have free entry into Alcudia’s Hidropark throughout their stay. It’s just across the road from Club MAC, so you can have fun on the waterslides, sunbathe by the pools and head back to the resort for lunch. Club MAC is built on wetlands which form part of the S’Albufera nature reserve. You can walk to the wider reserve behind Playa de Muro, where you’ll find bird observation hides, marked paths to follow and observation decks. With such beautiful surrounding countryside, there are plenty of hikes to try out. Head into the Tramuntana mountains for marked walking trails and spectacular views. Here is a route for a morning’s hike into the mountain behind Club MAC. It’s 4.5 hours and takes in some beautiful scenery and views. To get the best deal on a Club MAC holiday in 2019, book directly with us via the website and book flights directly. It’s simple and cheaper than package options. We look forward to welcoming you next year!